Keem Bay, Achill Island: Five blue-flag beaches would be an impressive tally anywhere, let alone on a single island. But thats Achill for you. Keem Bay is a Signature Discovery Point on the Wild Atlantic Way, and for good reason… its breathtaking beauty inspired visiting artists like Paul Henry, Graham Greene and Nobel laureate Heinrich Böll, and continues to wow visitors today. From murmuring motorways to bumpy boreens; from unplanned stops to salt spray on the windscreen, there's just something about a road trip. Something that, despite the traffic and tractors and petrol prices and car rental up-sells, retains an incurable romance. 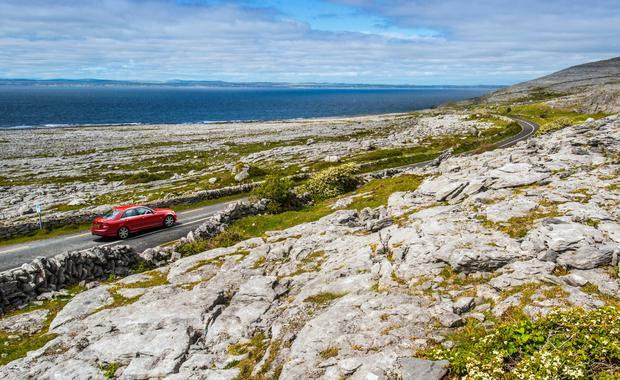 I've driven all over the world, from the Bavarian Alps to the USA's Deep South, but I look forward most to road trips Ireland – and here are 10 of the best Irish drives. Make a plan, but leave it loose. You never know what lies around the next bend. Starting in Manorhamilton, Co Leitrim, take the N16 to the gushing Glencar Waterfall. Youre bang in the middle of Yeats “waters and the wild” here, and the literary landscapes continue as you follow the local road along the shore of Glencar Lough, joining the N15 just below the prow of Ben Bulben. Head north here to see the poets grave at Drumcliff (“Cast a cold eye…”) and, if time permits, take a spin around Mullaghmore for Wuthering Heights-style views of Classiebawn Castle, before detouring inland towards the epic Gleniff Horseshoe and Benwiskin. Its hard to believe such a variety of National Geographic-standard views exist within just a few dozen kilometres. From here, the drive back to Sligo takes 35–40 minutes. Time/distance: 76km (allow at least a half day if taking all suggested stops). Pit stop: The Davis familys Yeats Tavern (yeatstavernrestaurant.com) is an obvious stop near the poets grave at Drumcliff. if you like that, try this: Galways Slieve Aughty mountains offer a surprisingly desolate drive, ending up in Lady Gregorys Coole Park. Dubliners neednt cross the country for a scenic drive. 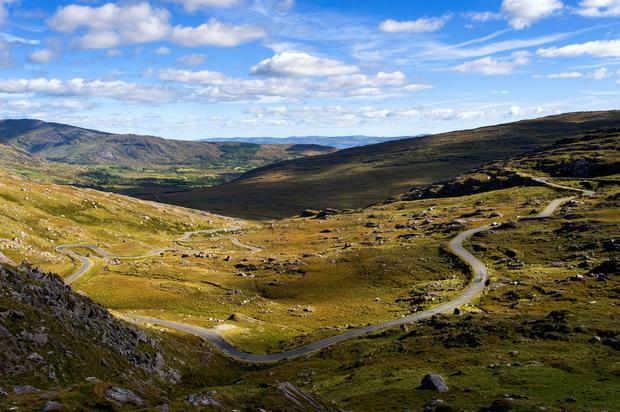 The Sally Gap is just 45 minutes from Dundrum Town Centre, taking the Old Military Road (R115) through Glencree. Within moments, it seems, youre floating through the Wicklow wilderness, passing the source of the River Liffey, among other natural wonders. From this point, you can continue south past the Glenmacnass Waterfall to Glendalough, or head southeast on the R759 for views of Lough Tay (in a certain light, it looks just like a pint of Guinness). The R755 will take you back by the Sugar Loaf to the N11 at Kilmacanogue. Time/distance: 97km (via Glendalough). Allow a half or full day, depending on stops. Pit stop: Nab a cuppa and cake at The Conservatory in Laragh (theconservatory.ie). if you like that, try this: The drive from Co Tipperary to Co Waterford via The Vee, emerging to a jaw-dropping view of Lismore Castle, is a stunner. Time permitting, add the Comeragh Drive. Irish drives dont come sweeter than the Sky Road. This simple, 15km peninsula loop transports you onto the craggy folds of the Connemara coast in no time — with views ranging from Inishturk offshore to the Twelve Bens inland. Its doable as a cycle, but driving allows you to swing north when you re-emerge onto the N59, before turning left towards Claddaghduff and proceeding towards the jewel in the Aughrus Peninsulas crown: Omey Island (aughruspeninsula.com). Check the tide times before setting out, as Omey is reached by driving across a sandy causeway… an even more important note for the return journey. When you have to ask whether an island is open or closed, youve truly reached the ends of the earth. Time/distance: 40km. Allow at least a half day if travelling to Omey. Pit stop: Pick up a picnic full of local goodies at The Connemara Hamper (connemarahamper.com) in Clifden. 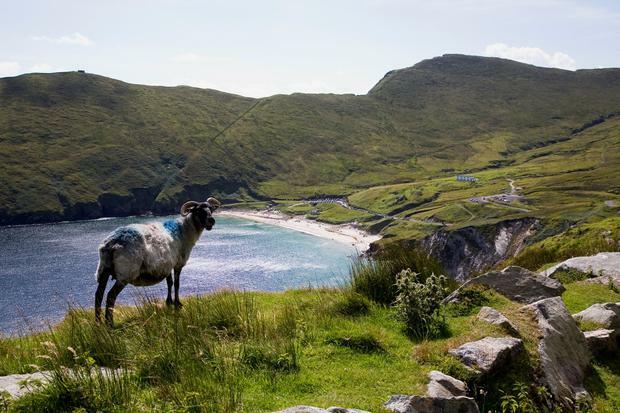 If you like that, try this: Circuit West Corks Sheeps Head — the Wild Atlantic Ways wildest peninsula. Michael Palin once dubbed the train ride from Derry to Coleraine as one of the most beautiful on earth, and the drive is right up there too. As well as the obligatory Giants Causeway and dram of Bushmills (after your drive, of course), this rockin piece of coastal real estate has been born again as Game of Thrones country, with locations from the HBO series ranging from Ballintoy Harbour to Portstewart Strand. 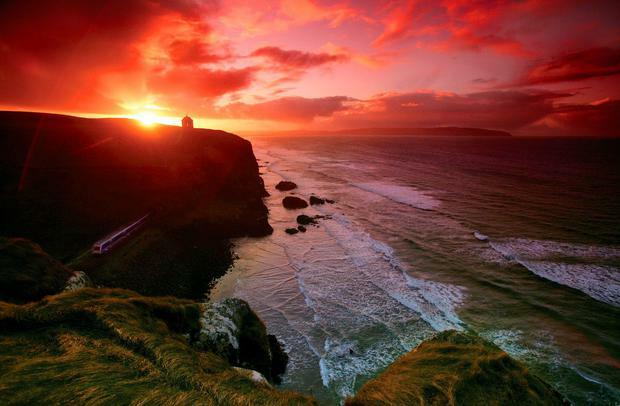 Throw in Dunluce Castle, Mussenden Temple and the Carrick-a-Rede rope bridge, and you have an itinerary that could sprawl over two or three days. At Ballycastle, continue to Cushenden, or take the A44 south towards Belfast. Time/distance: 100km (Derry to Ballycastle). Allow a full day with stops. Pit stop: Ballintoys Fullerton Arms (fullerton-arms.com) is home to one of 10 Game of Thrones doors carved from fallen trees at the Dark Hedges. If you like that, try this: Spot sea stacks, secret beaches and old mining husks on Waterford's Copper Coast — a 40km spin from Tramore to Dungarvan. 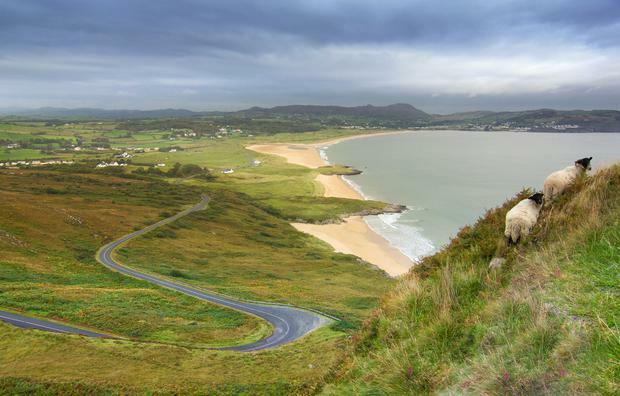 Donegal throws up any number of scenic drives, from Slieve League to Star Wars locations on the Inishowen 100. The Fanad peninsula has a little bit of everything, however — and arguably the countys best beach at Portsalon. Taken as a loop from Letterkenny, drive north on the R246, stopping at Fanad Head before returning south via the Knockalla Coast Road to Rathmullan. 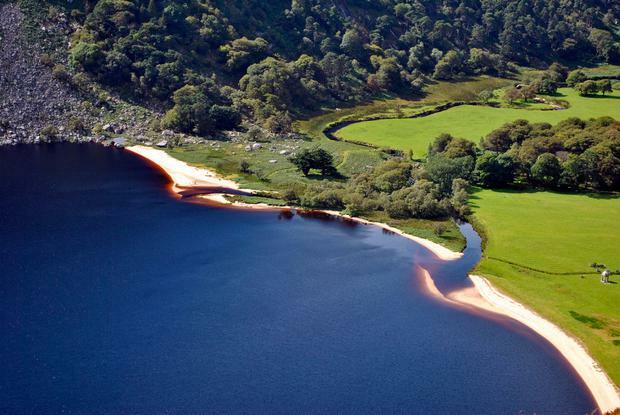 The views over Ballymastocker Bay are breathtaking here —its the perfect stop for a swim, too. Time/distance: 96km (to/from Letterkenny). Allow a full day with stops. Pit stop: Grab a pizza and Kinegar craft beer in The Tap Room at Rathmullan House (rathmullanhouse.com). 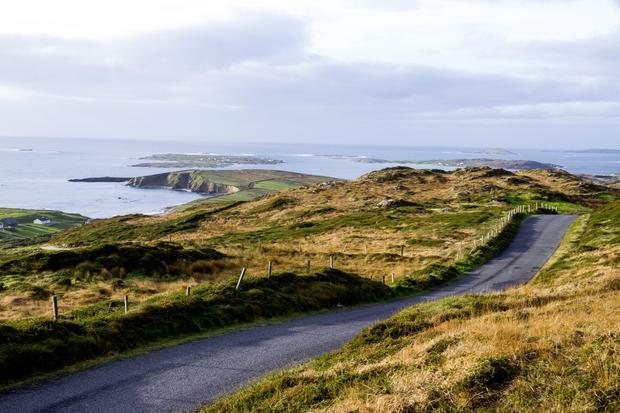 If you like that, try this: Corks Mizen Head Drive is a 100km circuit of the southern peninsula, passing beautiful Barleycove and ending up at a cliff-hugging former signal station. You could do the Wild Atlantic Ways full 2,500km, or you could pick stretches at your leisure — and few are as worthy as Achill Island and the desolate Currane Peninsula. Achills Atlantic Drive is a short, 19km loop, but you can veer on and off at will — detouring out to Keem Bay, for instance, or to the views from Minaun Heights. Start from Westport to catch the full splendour of Clew Bay and the changing scenery, or take to the Great Western Greenway if you prefer two wheels. Time/distance: 150km (to/from Westport). Allow at least a day. Pit stop: Stop for lunch, or swap car for bike at Mulranny Park Hotel (mulrannyparkhotel.ie). If you like that, try this: Valentia Island and the Skellig Ring are a brilliant way to get off the beaten track on the Ring of Kerry. You dont need a coastline for a classic Irish drive. 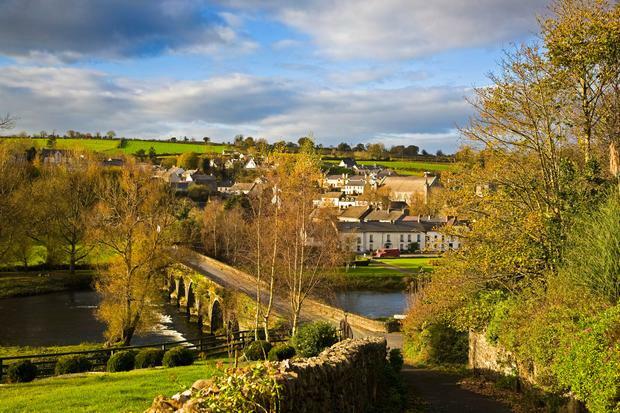 Setting out from Kilkenny, follow the River Nore through Bennettsbridge, Thomastown and Inistioge, stopping at will for bites and browses before crossing the latters beautiful, 10-arched stone bridge and turning northeast towards Graiguenamanagh. The River Barrow comes into view here, and you can continue on the R729 to the village of Borris, crossing briefly into Carlow before taking the R702 back through Goresbridge and Gowran to Kilkenny. Family-friendly stops along the way include Woodstock Gardens (woodstock.ie) in Inistioge and the surprising National Reptile Zoo (nationalreptilezoo.ie) in Gowran. Time/distance: 75km (to/from Kilkenny). Allow a full day with stops. Pit-stop: Pop into Circle of Friends café in Inistioge — named for the 1995 movie, based on Maeve Binchys novel. Oh, and leave room for dessert. If you like that, try this: The 166km Gordon Bennett Route (gordonbennettroute.com) is named for the 1903 road race that passed through Kildare, Laois and Carlow. “And some time make the time to drive out west / Into County Clare, along the Flaggy Shore…” So wrote Seamus Heaney in his mouthwatering Postscript. The poem was written in a burst of inspiration, Heaney later explained, as he drove along the south coast of Galway Bay — later characterising it as a sort of “holiday postcard” to his driving companions. Starting from Kinvara, head along the shoreline, cornering around Black Head before passing great molten swathes of the Burrens karstic limestone and the beach at Fanore (the Cliffs of Moher are an option too). Moments on this drive might “catch the heart off guard and blow it open”, as Heaney so memorably put it. Time/distance: 70km (Kinvara to Lahinch). Allow at least a half day with stops. Pit-stop: Grab a homemade ice-cream on the Flaggy Shore at Linalla (linallaicecream.ie), or lunch at the Wild Honey Inn (wildhoneyinn.com) in Lisdoonvarna. If you like that, try this: Continue south through Kilkee onto Loop Head. From Carrigaholt, you can book dolphin-spotting trips on the Shannon Estuary. See loophead.ie. The Ring of Kerry is a world-class touring route, but it gets so thronged with tour buses at times that you lose the elemental nature of it all. One peninsula to the south, Beara offers all of the wonder with less traffic — taking you from Kerry to Cork, from civilisation to a cable car dangling over the Atlantic (your transport to Dursey Island), and from melodious-sounding towns like Allihies and Eyeries to the countrys biggest white fish port at Castletownbere. Give yourself lots of time, make plenty of stops, eat fresh fish, wonder at the corkscrew twists and turns, and detour through the Healy Pass (R574). Its a road that ranks right up with the most dramatic on earth. Time/distance: 137km (skipping the Healy Pass); allow at least a day for this one. Pit stop: Between Kenmare and Glengariff, keep your eyes peeled for Benoit Lorges chocolate shop (lorge.ie). He does chocolate-making courses, too. If you like that, try this: Donegals Slieve League peninsula offers similar flashes of remoteness — with the Gaeltacht village of Glencolmcille at its end. Think of the Boyne Valley, and history springs to mind. Nine thousand years of the stuff, from Newgrange to the Hill of Tara and grisly Oliver Plunketts head (on display in Droghedas St Peters Church, if it takes your fancy). 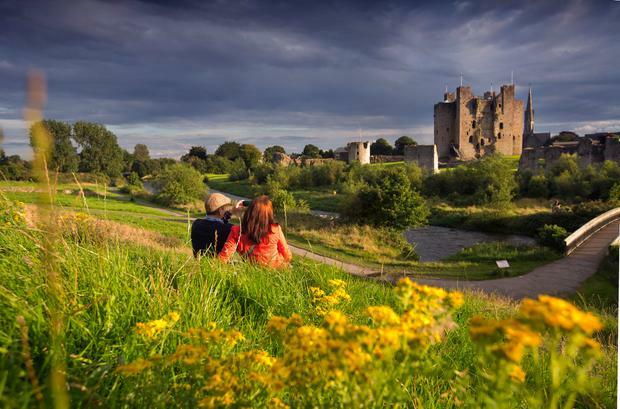 All of this and more feature on the Boyne Valley Drive (boynevalleydrive.ie), a loose, figure-of-eight route skirting 22 historic sites from Drogheda to Navan, Kells, Trim and other towns. But theres more to the region than whats past — as the Boyne Valley Food Series (boynevalleyfoodseries.ie) attests: it includes dozens of foodie events, from apple blossom walks to backyard barbecues. Time/distance: 225km (the full route, though you can do much shorter sections). Pit stop: Slane Castle opens a new whiskey distillery, tour and café shortly — see slaneirishwhiskey.com for more. If you like that, try this: The nearby Cooley Peninsula is another humdinger on Irelands Ancient East. NB: Distances and journey times are meant as guides only, and will depend on routes, traffic and times of year.